ISBN 9790006522835. 31 x 24.3 cm inches. 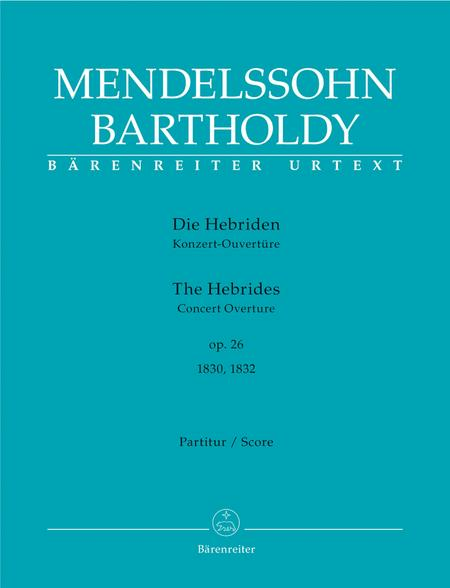 The Hebrides , the third in Barenreiter's series of critical editions of Mendelssohn's great overtures, is one of Mendelssohn Bartholdy's most performed compositions. Today this work is only available in one composite version: the Julius Rietz edition from the 1860s. The new Barenreiter edition will consist of two versions each containing additional material from further sources. Version one, theRomeversion, exists itself in two versions and has never been published in a performing edition. Version two, theLondonversion, also exists in two versions one of which was published by Mendelssohn in 1835. This pioneer edition documents the development of the composition and the various changes made by Mendelssohn. The new edition offers orchestras for the first time the possibility to perform this famous work based on all known sources. February 27, 2005 What a find! I accidently came accross this magnificent piece [..] and fell in love with it straight away,i would love my orchestra to play this and i would encourage as many artists to get their hands on this music! play it!! you'll love it!